CRIME drama Bodyguard has been named as BBC iPlayer’s biggest show of the year after reaching 10.5 million requests on the video service. Every single episode of the Golden Globe-nominated drama made it on to the service’s top ten episodes of 2018, with 41.3 million requests on the box set. 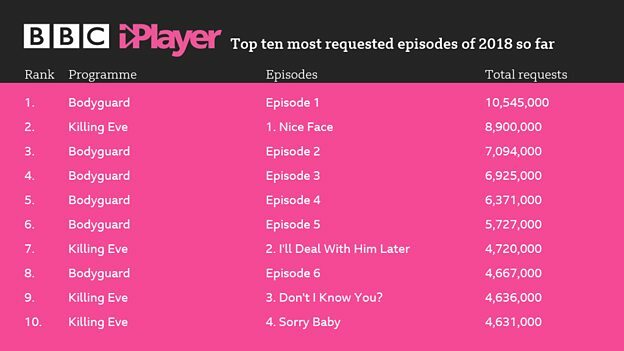 Dan McGolpin, controller of programming for the BBC, said: “It’s been a fantastic year for BBC iPlayer, driven by an array of top quality programmes. Bodyguard, Killing Eve, McMafia, Doctor Who, Our Girl and Silent Witness are all available to watch now as box sets on BBC iPlayer, alongside many other series. This year, the BBC will consult on plans to meet audience demands by improving iPlayer with more box sets and enhanced user experience.